This week marks the first year blogoversary of "I heart post"! 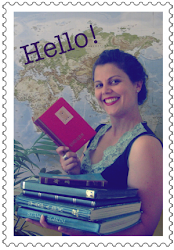 Who knew that stamps could keep me entertained and propel a blog for a whole year?! In my second post on the blog, where I was really testing out the concept, I wrote about some stamps I bought in Mongolia as souvenirs during a trip back in 2004. 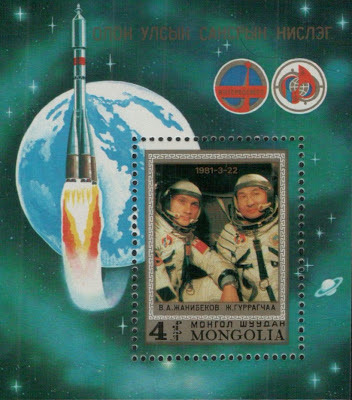 Well, this week we have come full circle, and I am returning to the country where I started, with space stamps from Mongolia. 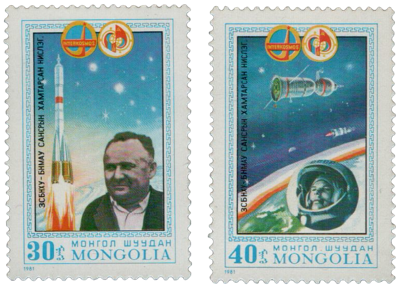 The above stamps feature the Russian cosmonaut Yuri Gagarin, who was the first person to travel into space. Mongolia was the first former communist country I had ever visited, and I loved it. I chose quite a few space themed stamps as souvenirs, because I felt they had a real "soviet feel" about them. Gürragchaa spent 7 days, 20 hours and 42 minutes in space and docked with Salyut 6, a Soviet orbital space station. I also have another set of stamps with the symbol for the Interkosmos program on them, which also seem to celebrate Gürragchaa's mission. The stamps feature images of Mongolian and Russian co-operation, with the flags of both nations featuring on the stamps. 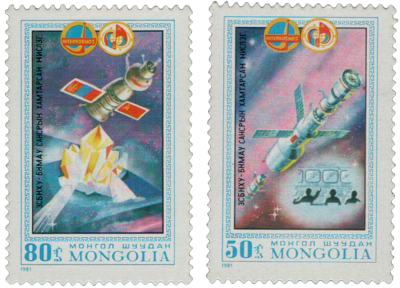 I love my Mongolian space stamps - I think they make a pretty gorgeous little collection. I also love the look of the cyrillic alphabet, and I love the word 'cosmonaut'... so really there is a lot to love in these stamps. I hope you have enjoyed this entry into Viridian's Sunday Stamps, and check out the link below for some more space stamps. I always like that Mongolia uses those long shapes for stamps. Great selection of stamps. I imagine Mongolia was a great place to look up at the night sky. I can see why you are so proud to own these stamps. Cosmonaut has always seemed more appropriate to me. What a wonderful collection. I do like their style. I esp. like the second to last one - are those crystals? emitting light beams? Thanks for sharing these lovely stamps. Thanks Viridian. Yes - they do indeed look like crystals emitting light beams! Pretty fabulous, right?!! Stamps on cosmonauts have a unique design as well as those posters of Soviet propaganda. Very cool! They recreate an atmosphere of science fiction in the 50's and 60's. It's hard to find stamps of Mongolia without postamark. Congratulations on the blog anniversary! You're right, they do have a Russian feel about them. I'd forgotten about the word cosmonaut, I like it too. This are rare stamps for me as I've never seen it before.